Several investigators have employed high throughput mitochondrial sequencing array (MitoChip) in clinical studies to search mtDNA for markers linked to cancers. In consequence, a host of somatic mtDNA mutations have been identified as linked to different types of cancers. However, closer examination of these data show that there are a number of potential pitfalls in the detection tumor-specific somatic mutations in clinical case studies, thus urging caution in the interpretation of mtDNA data to the patients. This study examined mitochondrial sequence variants demonstrated in cancer patients, and assessed the reliability of using detected patterns of polymorphisms in the early diagnosis of cancer. Published entire mitochondrial genomes from head and neck, adenoid cystic carcinoma, sessile serrated adenoma, and lung primary tumor from clinical patients were examined in a phylogenetic context and compared with known, naturally occurring mutations which characterize different populations. The phylogenetic linkage analysis of whole arrays of mtDNA mutations from patient cancerous and non-cancerous tissue confirmed that artificial recombination events occurred in studies of head and neck, adenoid cystic carcinoma, sessile serrated adenoma, and lung primary tumor. Our phylogenetic analysis of these tumor and control leukocyte mtDNA haplotype sequences shows clear cut evidence of mixed ancestries found in single individuals. Our study makes two prescriptions: both in the clinical situation and in research 1. more care should be taken in maintaining sample identity and 2. analysis should always be undertaken with respect to all the data available and within an evolutionary framework to eliminate artifacts and mix-ups. Mitochondrial DNA technology plays an exciting role in medical research especially the high throughput MitoChip for mtDNA mutation detection in cancer. In the past few years the MitoChip technique has uncovered a large number of mtDNA mutations in human head and neck, adenoid cystic carcinoma, sessile serrated adenoma, and lung primary tumors [1–6]. The majority of the MitoChip detected mutations were somatic (dominant in tumor cells) and it has been suggested that these mutations may be used as markers for the early diagnosis of cancer . However, many of these early stages MitoChip detected cancer mutations require accurate validation before put into routine clinical practice. Many recorded mtDNA mutations in cancer samples are not fully reliable. Employing a phylogenetic analysis of mtDNA tumor profiles taken from a specific example in the literature, we demonstrate the pitfalls of using MitoChip identified mitochondrial mutations for clinical diagnosis of premalignant cancers. The advent of MitoChip technology has allowed researchers to explore mtDNA for markers for primary cancers . Mithani, Maitra, Sui, Zhou, and colleagues, for example, have extensively used the MitoChip platform for mutation detection in primary cancer samples and uncovered a potentially large number of somatic mutations [1–6]. To validate the recorded somatic mutations in cancer patients we compared their mtDNA sequence with the currently available complete mtDNA database [7–14]. Mitochondrial DNA (mtDNA) is exclusively maternally inherited, thus different mtDNA lineages cannot mix or recombine: the only way that the mtDNA sequence can change is by the sequential accumulation of mutations along radiating maternal lineages. Therefore, the mutations seen in tumors samples arise on a background of a fixed mitochondrial germline haplotype-defining mutation. With this general concept, we first traced the lineage associated mtDNA mutations observed in tumors and normal tissue samples by comparing the mutation motif with the published world mtDNA phylogenies . Then, the mutations corresponding to haplotype lineages were paired with their normal tissue sample. If a tumor sample was distinguished from the corresponding normal tissue sample by the mutations that distinguish two different mtDNA lineages, then we could directly interpret that sample mix-up would produce the result, because the mutational processes involved in cancer could hardly produce, by chance, the mutations of evolutionary history. Recently, one hundred forty two mitochondrial mutations were identified from 22 adenoid cystic carcinoma patients, among these, three patients (#5, #6, and #21, see Mithani et al. supplementary table S1) accounted for 66% (94/142) of the total mutations . More nonsynonymous amino-acid-changing mutations were found in the nicotinamide adenine dinucleotide dehydrogenase (NADH) complex suggesting that these changes play a role in tumor development. Surprisingly the tumor-related somatic mtDNA mutations belonged to an evolutionary pathway in the mtDNA phylogeny. The leukocyte mtDNA sequences of patient 5, 6, and 21 belong to haplogroups K1a4a1a, J2a1a1, and H1, whereas the respective tumor sequence mutation themselves belong to different haplogroups: F1c, H1c3, and K1a4a1 respectively (Figure 1). Clearly what we see here are not somatic mutations but different mtDNA lineages stemming from different individuals which were exchanged with each other and attributed to the patients in question. 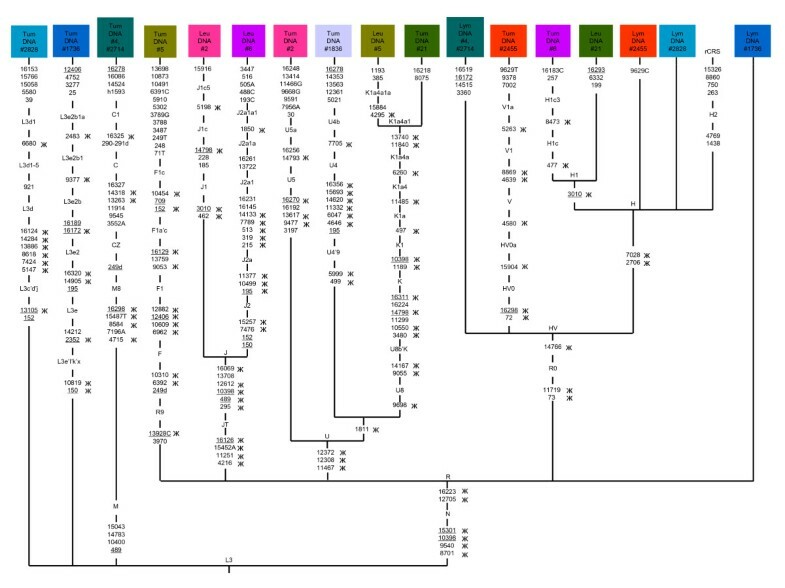 The mtDNA phylogenetic tree constructed on tumor cases: The Head and Neck Squamous Cell Carcinoma-HNSCC patients #1736, #1836, #2455, #2714, and #2828 are from Zhou et al., and patients #2 and #4 are from Mithani et al. ; and the Adenoid Cystic Carcinoma-ACC patients #5, #6, and #21 are from Mithani et al.. All mutations are scored relative to the rCRS (revised Cambridge Reference Sequence) , prefix h indicates heteroplasmy and a suffix indicates a transversion, d-indicates deletion. Tum, Leu, and Lym-indicates Tumor, Leukocyte and Lymphocyte respectively. "Ж" signifies haplogroup specific variants which were found in the patients. Recurrent mutations are underlined. The names of haplogroups are given at the branching points or along single branches. Designation of haplogroups follows van Oven and Kayser . Zhou et al. sequenced the entire mitochondrial genome of 83 primary head and neck tumor samples (Head and Neck Squamous Cell Carcinoma-HNSCC), and identified 228 mutations by comparison with matched normal blood leukocyte DNA (see their supporting information table 2). Subsequently Mithani et al. obtained the complete mtDNA sequence from salivary rinses of 13 HNSCC patients and found that salivary rinse mtDNA mutations were congruent with the sequenced leukocyte DNA (see their supplementary table 1), suggesting that salivary rinses of patients may also be useful in tumor risk assessment. Both the studies listed a large number of homoplasmic somatic changes, in particular sample numbers #2, #4, (Mithani et al. ), #1736, #1836, #2455, #2714, and #2828 (Zhou et al. ). Surprisingly, the phylogenetic analysis indicates that those listed tumor specific somatic mutations are known to follow the pathways of the African, Western Eurasian and East Asian mtDNA phylogeny. The samples #1736 and #2828 tumor sequence signify African lineages L3e2b1a and L3d1, whereas the leukocyte sequences follow the pathways of western Eurasian haplogroups R and H (Figure 1). 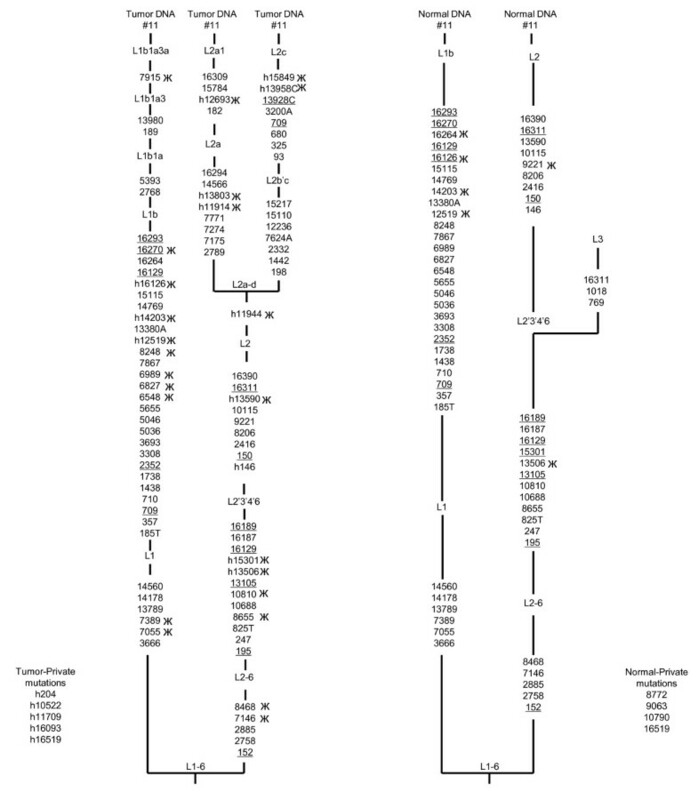 Similarly, other tumor samples #2, #4, #1836, #2455, and #2714 sequences variants were found in the western Eurasian and East Asian haplogroup V1a, U4b, U5a, and C1; in contrast, leukocyte sequence information points to the haplogroups H, HV, J1c5, R (Figure 1). It seems in these cases, large numbers of homoplasmic mtDNA alterations found in HNSCC patients are best attributed to sample mix-up. Another paper by Sui et al. aimed to demonstrate the existence of somatic mtDNA alterations in preneoplastic lesions of the gastrointestinal tract. In particular, they detected a high number (N = 35) of somatic mutations from a single sessile serrated adenoma patient (see their additional file 1, case 11), and add that their evidence supports the hypothesis that mtDNA alterations play a role in gastrointestinal neoplasia. However, we observe that many of the mtDNA alterations in tumor tissue are congruent with the African mtDNA haplogroups L1b1a3a (C6548T, T6827C, A6989G, A7055G, T7389C, C7915T, A8248G, C16270T and heteroplasmic mutations 12519, 12693, 14203, 16126) and L2a (A7146G, C8468T, C8655T, T10810C, and heteroplasmic mutations 11914, 11944, 13506, 13590, 13803, 15301), respectively. In addition, the heteroplasmic variants 13958 and 15849 are also found in the L2c haplogroup. Similarly, the mtDNA sequence of normal tissue showed mixed patterns. For example the four mutations - T12519C, A14203G, T16126C, C16264T have been found in haplogroup L1b lineages, and two other variants A9221G and C13506T have been recorded in haplogroup L2 lineages. Here, we see that sample mix-up generated the heteroplasmic and somatic mutations in case 11 (Figure 2). Furthermore, the authors observed one cytochrome oxidase subunit I polymorphism, - A7146G, in 3 adenomas (case 9, 10, and 11), and suggest a pathogenic role. Actually the heteroplasmic polymorphisms found in the case 9 and 10 result from mixing-up the samples of two lineages- L1b and L2, while the variant A7146G is belongs to the haplogroup L2. This effectively rules out a pathogenic role for A7146G polymorphism in adenomas. The phylogenetic reconstruction of the sessile serrated adenoma (SSA) case 11 mtDNA sequence from Sui et al.. For additional information, see the fig. 1 legend. Bandelt et al. demonstrate another case of sample mix-up in Maitra et al. data. The sample JHU-MITO # 12 tumor sequence belongs to haplogroup L3e3b, whereas lymphocyte sequence variants point to the haplogroup HV0a (refer Bandelt et al. Figure 1) which clearly shows that two mtDNA lineages were attributed to the same patient. In addition, there are numerous cases from cancer research where the sample mix-up could have lead to the false detection of a high percentage of tumor-specific somatic mtDNA mutations, as Salas and colleagues have pointed out [16–18]. The use of mitochondrial DNA mutation and/or polymorphisms patterns to serve as markers is a rapidly expanding discipline in cancer clinical research . With the advent of high-throughput techniques for the detection of mitochondrial DNA mutations such as MitoChip, increasingly researchers have been able to sequence entire mitochondrial genomes to promote an understanding of the mtDNA variants of tumor patients . With MitoChip technology, a large number of somatic mutations in the mitochondrial genome have recently been reported in head and neck, adenoid cystic carcinoma, sessile serrated adenoma, and lung primary tumors [1–6]. The majority of the somatic mutations were reported from the nicotinamide adenine dinucleotide dehydrogenase (NADH) complex and many were nonsynonymous amino acid-changing mutations. The investigators of these studies then suggest as a mechanism that the high incidence of amino acid changing mutations in the NADH complex causes increased reactive oxygen species (ROS) production and subsequently increases mtDNA mutation and dysfunction, which creates conditions which favor tumors cell growth [2, 3, 6]. In fact from our phylogenetic analysis, we can see that those predicted mtDNA mutations in the tumor cases were actually the result of sample mix-up or contamination. It is an unfortunate fact that many clinical geneticists are not aware of existing mtDNA phylogenetic tools and their power to elucidate medical data. We emphasize that careful assessment of newly identified mtDNA sequence variants must be undertaken in clinical studies before the start of large scale tumor diagnostic mtDNA genotyping projects. While researchers put much effort in a priori quality control and it is also important to put equal effort into a posteriori control by performing phylogenetic analysis. In clinical oncogenetics studies-this could help establish which mtDNA variants are truly associated with tumors. Identifying mtDNA markers related to cancers could be very helpful, but data should be collected, analyzed, and interpreted with special care. Our analysis demonstrates that a significant proportion of recorded somatic mtDNA alterations in tumor patients are attributable to sample mix-up. The authors wish to thank S.D.L. Miller, UEA, Norwich, UK for critical reading of the manuscript. MGP and YPZ designed the study, analyzed the data, and wrote the paper. All authors read and approved the manuscript.